The advent of iron mining had turned Two Harbors into somewhat of a boomtown. Not only was the iron ore industry causing increased harbor traffic, but coal carriers, lumber vessels, various commercial boats, and passenger ships added to the congestion. Thirteen hundred ships passed through Agate Bay alone in 1892, just eight years after the first load of Vermilion Iron Range ore left its docks. Breakwaters were built to make the harbor safer, but it needed a lighthouse. 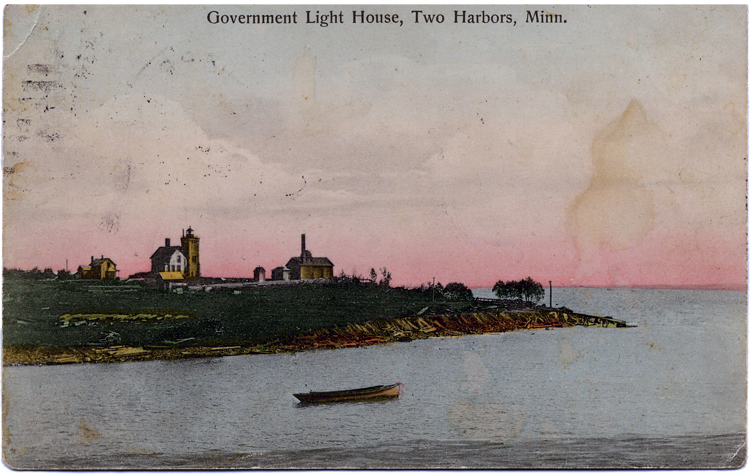 In March 1891 the U.S. government paid Thomas Feigh one dollar for an acre of land and almost immediately began work on a lighthouse. The lighthouse’s fourth-order Fresnel lens was lit for the first time on April 15, 1892. The twelve-foot-square tower stands just shy of fifty feet in the air and includes a watch room, a lantern room, a cleaning room, and even an extra bedroom for a second assistant keeper. The light tower connects to the keeper’s house, allowing the keeper passage without going outside in the winter. The tower’s walls are built in three layers of brick, the house’s with two; where they meet the wall is five courses thick, engineered to act as a fire break to keep the keeper’s family safe (the lamp oil was highly combustible).